Germany are still without a goal in the Nations League after a chastening defeat to Netherlands in Amsterdam. Virgil van Dijk, Memphis Depay and Georginio Wijnaldum all scored to earn Netherlands a 3-0 win over Germany and left Joachim Low's men still without a win or a goal in the Nations League. Liverpool defender Van Dijk pounced to nod home the loose ball on the half-hour mark after Ryan Babel had struck the crossbar with a header following a corner from Depay. The Netherlands 3-0 win against Germany is their first in any meeting since 2002 and their first in a competitive fixture since 1992. Germany had chances to grab a leveller after the break, with substitute Leroy Sane steering a glorious opportunity wide. They were also denied what appeared to be a clear-cut penalty in the final 10 minutes when Arnaut Groeneveld tripped Matthias Ginter. 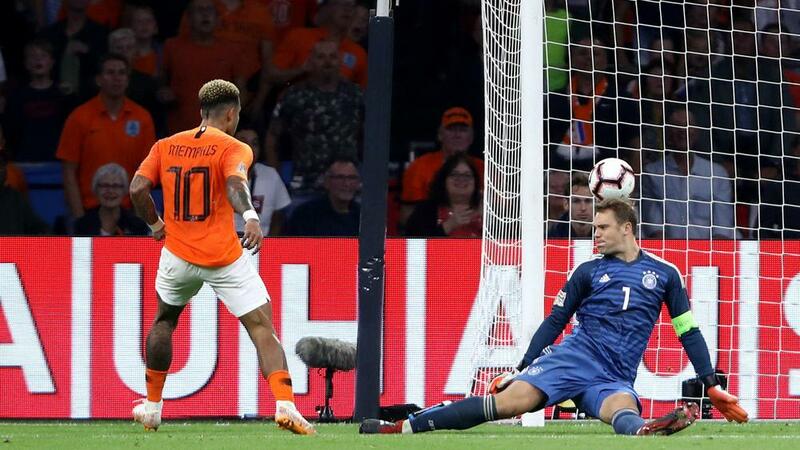 However, Depay added an 86th-minute second on the counter-attack and Liverpool midfielder Wijnaldum rifled in a third in stoppage time, securing Oranje's biggest ever win over Germany. It leaves Low's side in danger of relegation in League A Group 1, of which they are bottom, having drawn 0-0 with France in their first game.